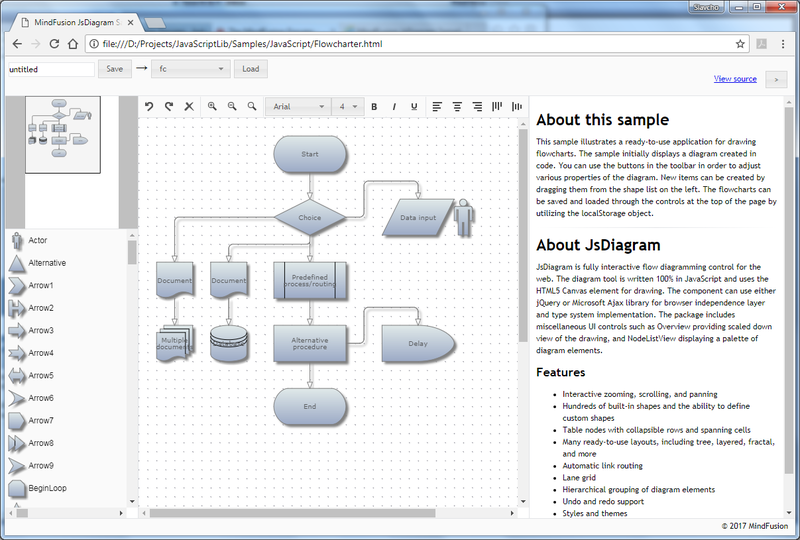 I am developing my JsDiagram application with Firefox, so far, it works well. But I found the overview object can't display well on Chrome. I tried the Flowcharter example, the appearance is not good (the text size on overview is even the same on diagram). Is there any way can make the overview area like the attachment expected.PNG? What version of the library, Chrome and operating system are you using? It looks fine with my v3 diagram, latest Chrome Version 59.0.3071.86 (Official Build) (64-bit), Windows 7. I have reset my Chrome and try to apply JsDiagram V3, the result is still bad! After more and more try, I found the cause: It's caused by Chrome's language setting! After making Chrome's language to "English Version", the appearance became okay just like your post. Will you fix this issue? Apparently DrawingContext2D.font from Canvas API does not work with fonts smaller than 4-5 pixels on Chinese Chrome - it enforces a minimum size. The control removes scale transforms and multiplies the font size instead when drawing text, because text with scale transform was rendered ugly in older versions of Chrome. We'll check if they look better now and will start rendering with scale transforms again which should fix that. The Chinese version (left side of attached image) shows it several times larger than the English one, at least when we try English texts. So we'll keep using our current method of drawing texts. Only option we can think of is to disable texts in Overview altogether - we'll try to add that for upcoming small release. Set overview.minVisibleFontSize = 3 or 4 and it should stop rendering text. Thanks for the new version, it worked well in my project. Just for your reference, the NodeListView has the same problem (custom nodes on NodeListView), I met it and modified my nodes' drawing function to avoid the bad effect. Hope it will be fixed. Same minVisibleFontSize flag should work for the NodeListView too, it's defined in our base Canvas class from which all other controls derive. Before my last post, I ever tried to set minVisibleFontSize flag on NodeListView and it didn't work.